Looking for that inspirational gift to cherish for a life time and not just for Christmas? We have plenty of choices for the whole family as well as the home and even your pets, all crafted from nature’s finest fibres. For that special man in your life, treat him to a slice of heaven for his feet with our sheepskin slippers, available in a range of different styles to suit all tastes, and in an array of colours. Thinking along the lines of more practical gifting for him? We hand craft sheepskin glasses cases that keep specs clean and protected when on the go. Does he need a new bag for work or weekends away? Our Leather Holdall is the perfect size for storing and organising everything he needs. 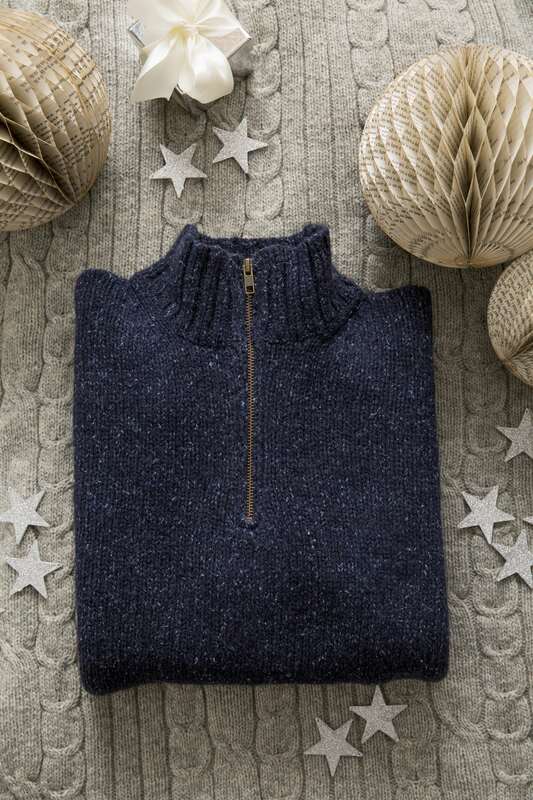 But to really treat him this Christmas, there's always our soft knitwear that he'll enjoy wearing for years to come like our Zip Neck Jumper, made in Britain from a wool and silk mix. Treat little toes and delicate skin to the comfort of sheepskin, which is naturally thermostatic, making it warming in winter and cooling in summer. Our tiny, cosy Pram Shoes are machine washable (handy!) and designed to be soft on growing feet. On all our baby products, the sheepskin wool is shorn short for safety, making it the softest texture to snuggle up to. Our Infant Fleece is a good example of this and makes for a great natural pram liner or play mat. Also, nothing beats the feeling of our Flat Out Bear, a perfect comforting companion for babies and children alike. For older children, cosset their feet in our handcrafted British sheepskin footwear. They can have matching boots or slippers just like Mum and Dad as our Toscana, Celt and Classic boot ranges, plus Bootee slippers come in a wide range of colours and sizes just like the grown up versions. The perfect present for your pet! We have a cute new member of the Celtic & Co family to introduce to you all… Everyone say hello to Trevor the Cockapoo (yes this is a link to his own Instagram page)! Along with Alfie, the Whitworth's Brittany Spaniel, they’ve both been making all of us smile here in the Marketing Office, dashing around playing together, especially when they are both wearing our knitted Dog Jumpers. 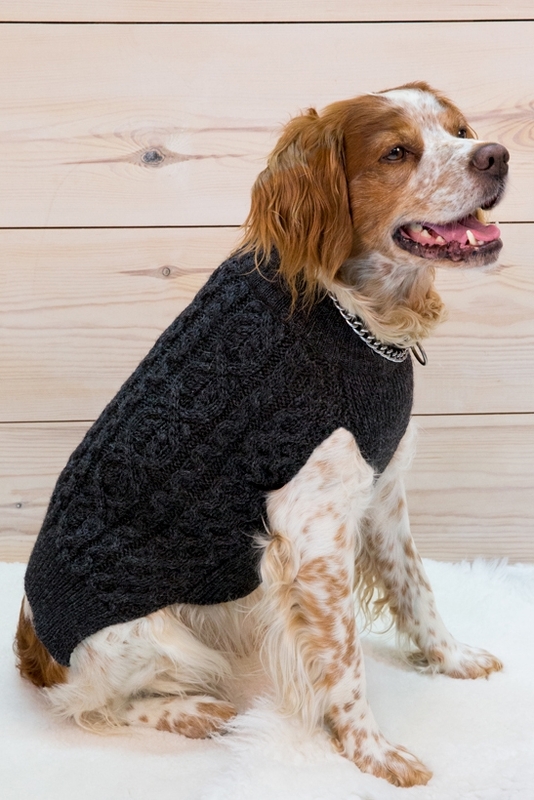 Made in Britain from 100% Merino, your pet pooch can remain cosy and warm when it’s icy outside on their daily walk. 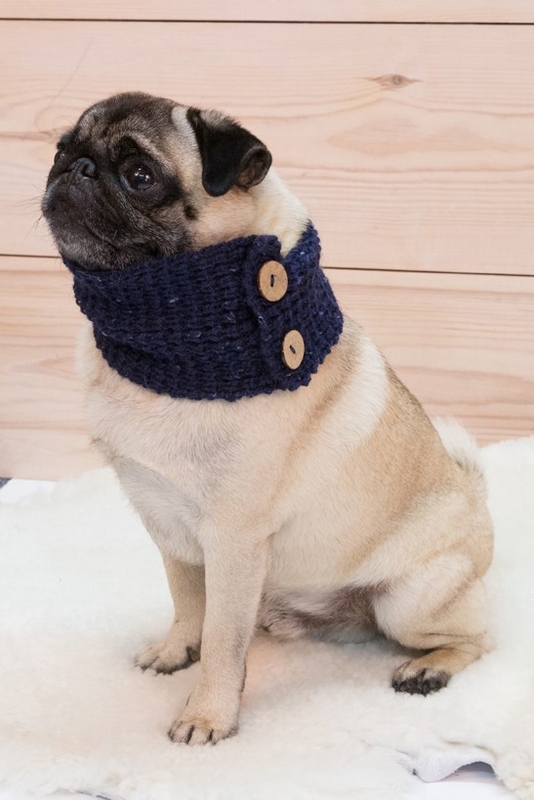 If your dog just needs a little coverage when out on a winter’s day, then we offer a cute Dog Snood instead, made from 100% lambswool and modelled here by the very handsome Lloyd the Pug. Dogs don’t have to have all the fun, you can now treat your cat (or even rabbit, if you have one that hops around the house) to one of our soft Pet blankets. Although we've pictured ours here with Trevor's friend Dozer, the British Bull Dog puppy who slept through the whole photoshoot. Our sheepskin blankets are available in two sizes and are machine washable too, meaning it will come up like new every time. You can thank us later. Make a house a home whilst giving a nod to the Skandi way of cosying up in front of the fire by mixing up textures and subtle tones. Our sheepskin rugs now come in a wide selection of different breeds, some with short straight wool and others with long curls. Layer these up on the floor or scatter on the backs on sofas and chairs to blend these great natural textures together. Add some throws or blankets too, perfect for grabbing when needing to wrap up, or go all-out with our super Chunky Cable Throw, hand crafted from 100% merino lambswool and totally indulgent. If you want to make a statement in your home, then treat your lounge or bedroom to one of our large Sheepskin Beanbags. Covered in ultra-soft sheepskin, this beanbag will turn any home into a blissful haven, and is so cosy, you may never want to get back up again!